The race for acquisitions in Europe’s thriving technology sector is heating up, with valuations skyrocketing as an increasing number of private equity firms compete against traditional buyers and newcomers to the market, reflecting the appetite and amount of liquidity in the region, according to global news provider TMT Finance. “Traditional strategic acquirers in the space have become slightly less active of late, while private equity firms are now accounting for a large slice of deals which is helping to send valuations skyrocketing as EBITDA multiples hit all time highs,” commented TMT Finance reporter Kezia Joseph. “The market has also opened to historically “non-tech” buyers, many of which are seeing new opportunities in previously untapped technology verticals and the move towards revenue-rich subscription models, away from traditional licensing ones,” she added. Over the last year, assets which drew the most attention from bidders included the sale of British fibre and cloud-services operator Interoute, with US telco GTT Communications seeing off competition from PE firms I Squared Capital and Bain Capital, as well as fund Wren House Infrastructure Limited, backed by Kuwait Investment Authority. The sale of French electronic trading platform Ullink only saw one strategic, and eventual winner, Nordic Capital-backed Itiviti active in the bidding process, alongside four PE firms: KKR, Advent International, Hellman & Friedman and Bain Capital. In Germany, the sale of cloud and managed services provider PlusServer saw strategic bidders Iomart and Rackspace compete against Bain Capital, KKR and BC Partners, with the latter eventually acquiring the business for E397m. This shift in the market will be among the topics discussed by senior executives from Europe’s leading technology companies and investment banks at the Tech M&A Forum 2018 in London on May 23. The latest merger and acquisition opportunities impacting the region will be covered, alongside key session themes including SaaS, IT Services, Fintech and Digital Platforms. Key speakers already confirmed at the event include CxOs and deal leaders from Atos, Brandwatch, Cinven, Blippar, UBS, MMC Ventures, Oakley Advisors, ING, Houlihan Lokey, Société Générale, Kantox, Lightfoot Invest, NCC Group, Fruugo.com, Boston Scientific, Clipperton Finance and Codec, among others. 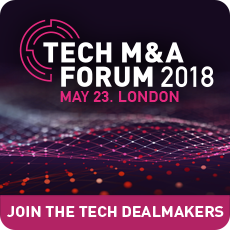 Tech M&A Forum 2018 is part of the two-day TMT M&A Forum 2018, which takes place in London on May 22-23. The event will gather senior telecom, media and technology M&A leaders (CEOs, CFOs, Heads of M&A and Strategy), investment bankers, private equity investors, professional and legal advisers to discuss how convergence is driving consolidation across TMT. Over 150 speakers and 350 delegates are expected at the event which is senior executive only and Chatham House Rules.